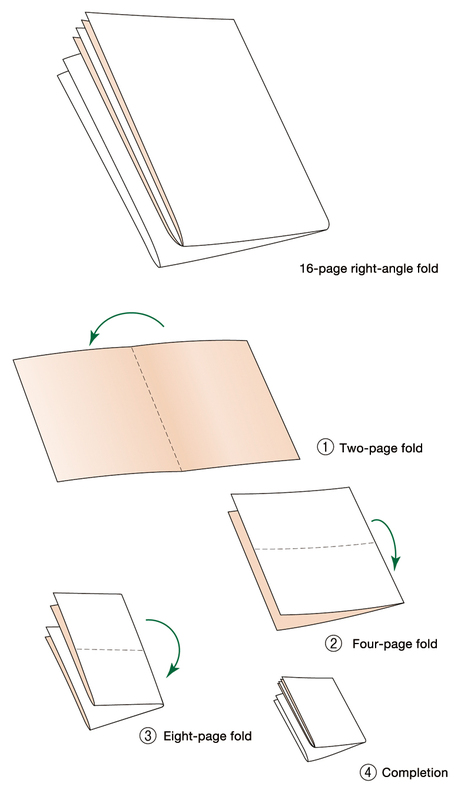 Folding, in the case of books or magazines, is the name for the process by which the printed sheets are folded, accordion style, into the size of a book. Normally, books are made using sheets with multiple pages printed on each side, and then folding those sheets so that the book is the size of a single page. For example, when printing an A5-size book using the JIS standard size of A-series paper (625 x 880mm), 32 pages can be printed on a single sheet. This sheet is then cut into two halves, each with 16 pages, which are then folded in half three times, reducing it to the size of a single page. The resulting folded sheet is called a signature; when all of the signatures are bound together, it takes the form of a book. There are many methods to folding printed sheets, but the most widely used one is called a “right-angle fold.” First, the printed sheet is placed horizontally and folded in such a way as to align the left and right edges. Next the paper is rotated clockwise 90 degrees, so that the fold is directly in front of you. Again, the paper is folded by aligning the left and right edges. The same process is repeated once more, so that the paper is folded into eighths. As one folds the sheet so that it comes to be divided by page, the pages on the printed sheet end up in a certain order. For that reason, it is essential to layout the original sheet (in the sense of both position and orientation) in such a way that, once folded, the pages will be in the proper sequence (imposition). 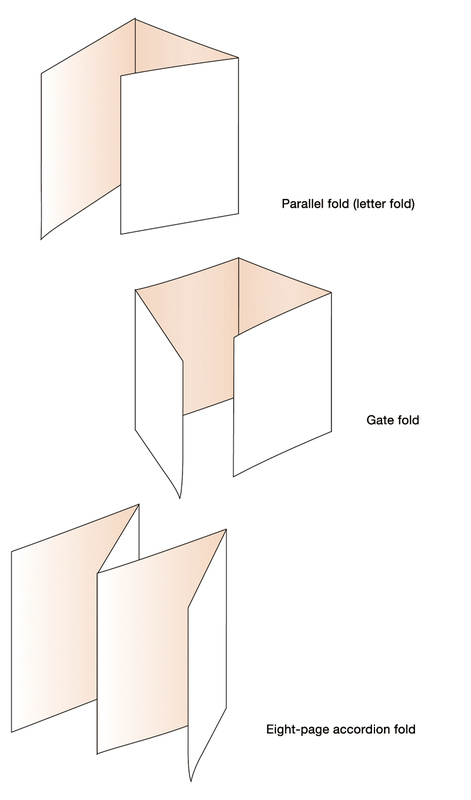 There are other ways that the folding can be done, such as the parallel fold.